A lot has been done in a month of renovations! 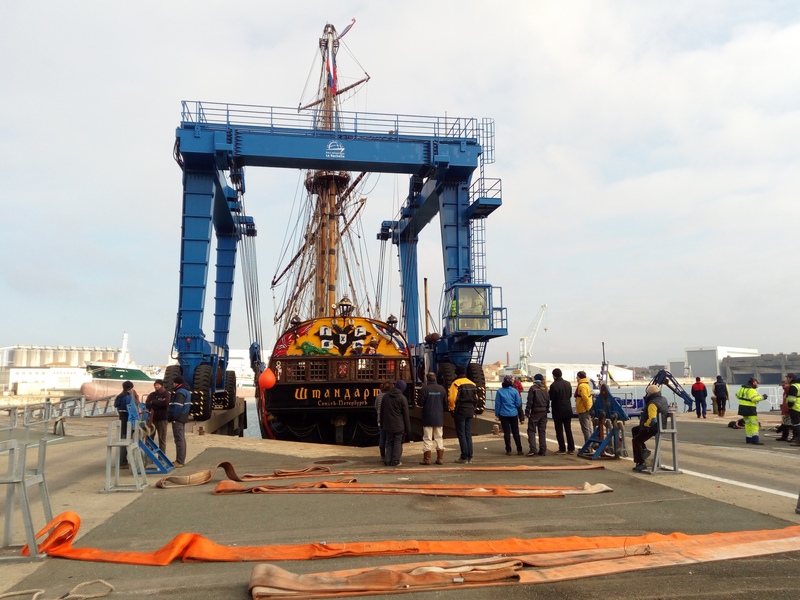 For 2 weeks the Shtandart stood at La Pallis shipyard, where it was moved from the La Rochelle berth on November 19. 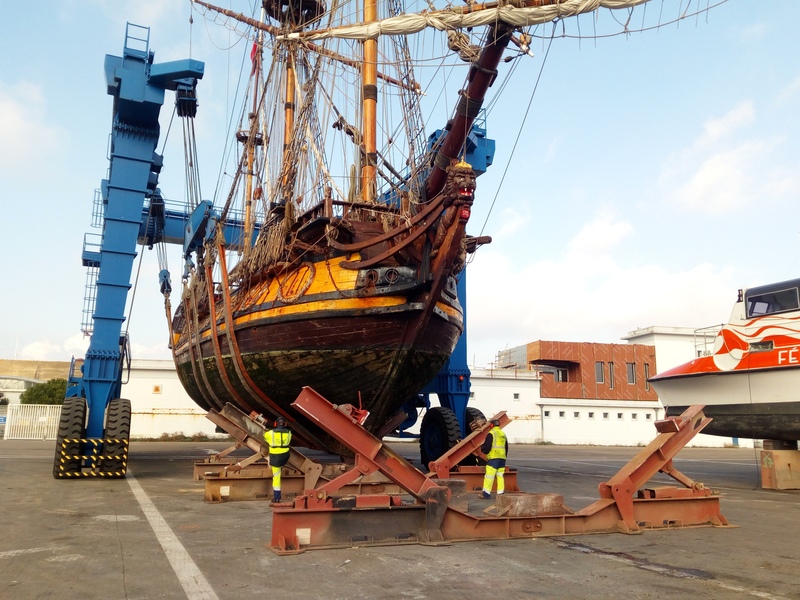 Here the ship was hauled out by a powerful crane for preventive below waterline check-up and repairs. The ship was also weighed. The weight of the ship is 223.1 tons, with full water tanks (6 tons), minimum amount of fuel (1 ton), and other tanks being empty. 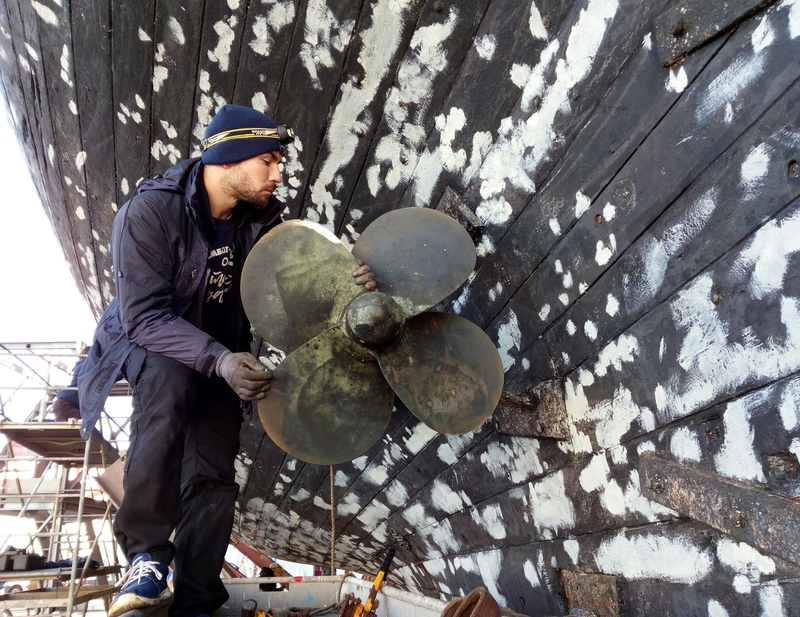 During 2 weeks of hard work the hull below the waterline was cleaned, painted and covered with a fresh layer of antifouling paint. All the seacocks,underwater pipes, valves and shaftswere checked. Also, the lightning rods were renewed and the rubrail was repaired. 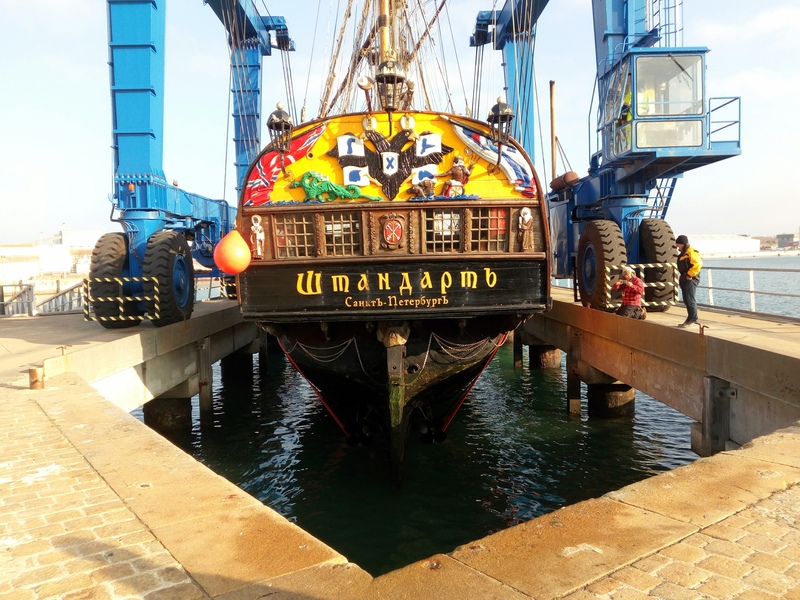 On December 3, the repair of the hull below the waterline was completed, and the Shtandart was launched. 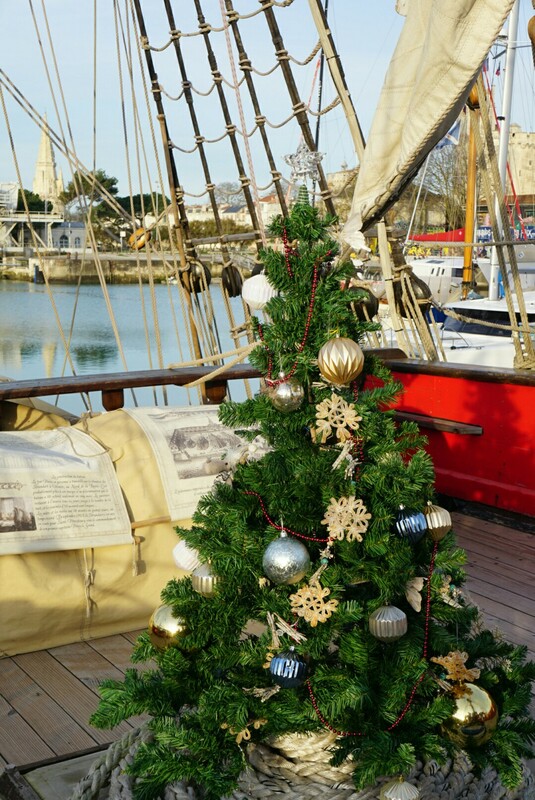 From now until March 8th, the ship is moored in the heart of La Rochelle. It is a great pleasure to prepare your favorite ship for new trips with a friendly team! We filmed a movie too! 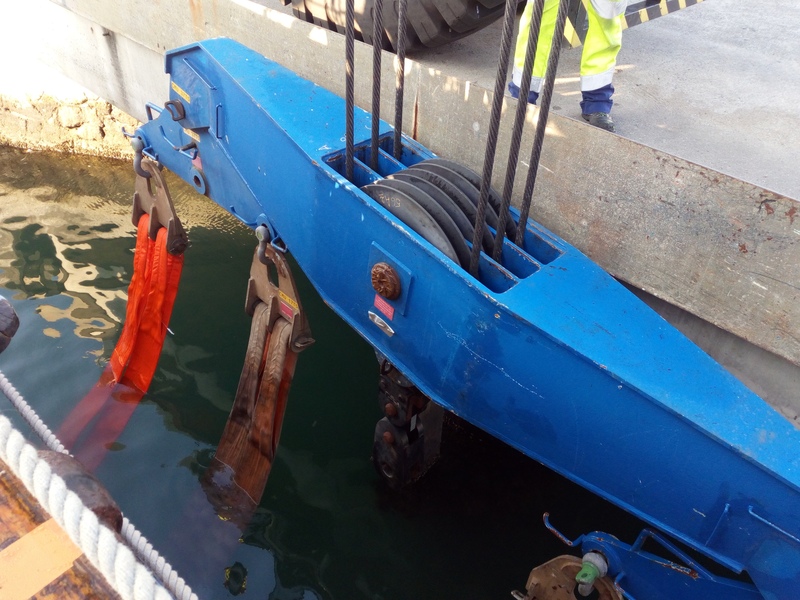 France is a country with a rich history, the notorious city of La Rochelle attracts the Shtandart every year, and as a dry dock we chose a submarine base with a bunker from the Second World War. This is Mr. Dumas who was responsible for lifting the ship and who measured our hull , length and breadth, with a small ruler and measuring tape. France is a country of contrasts, despite the lack of civilization outside the dock. 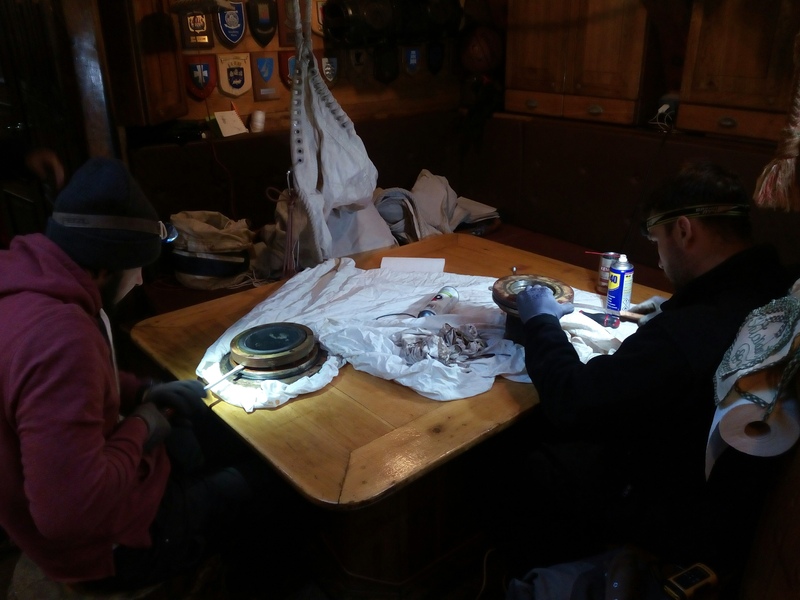 All repair works were carried out without tension, for any cunning nut or heavy object the French had special equipment, and our hardworking bosun was always ready to motivate or criticize the achievements of his “slaves”. France is a country of seafood, we scraped oysters from the bottom and felt a kind of unity with the world around us. 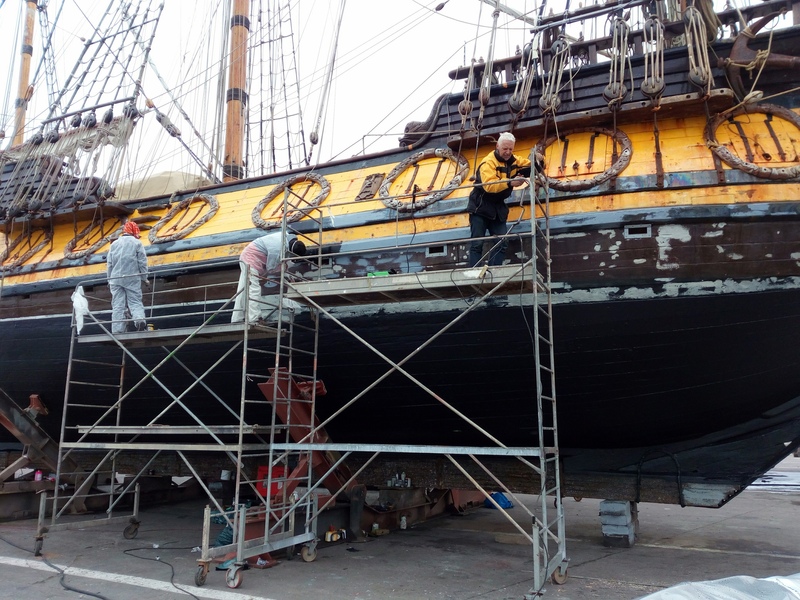 France has a mild climate, the nature itself carefully rained our antifouling paint, preventing it from drying out and losing its useful properties, and when the winds carried away the rains, we could easily paint. France is an elegant, sophisticated country with a unique culture. Inspired by this and having mastered the local “bonjour” and “comme ci comme ça”, we jokingly fought for the scaffold to have the opportunity to put the paint on, layer by layer, with our own elegant movements. France is a country where all people are friends and brothers, and it is at a friend’s price that we were told in the nearest bar that we should not drink their wine in order not to go blind. France is about love. This video demonstrates our love for the ship. Love to work in a diverse, multi-national team, with one common goal and it does not matter which goal that is. We're getting ready for New Year's Eve Party without taking a break from work! Since the whole city is already decorated, the spirit of Christmas is in the air, and fairy lights are shining everywhere, we do not want to fall behind. The New Year's tree is here, the lights glow in the mess room. 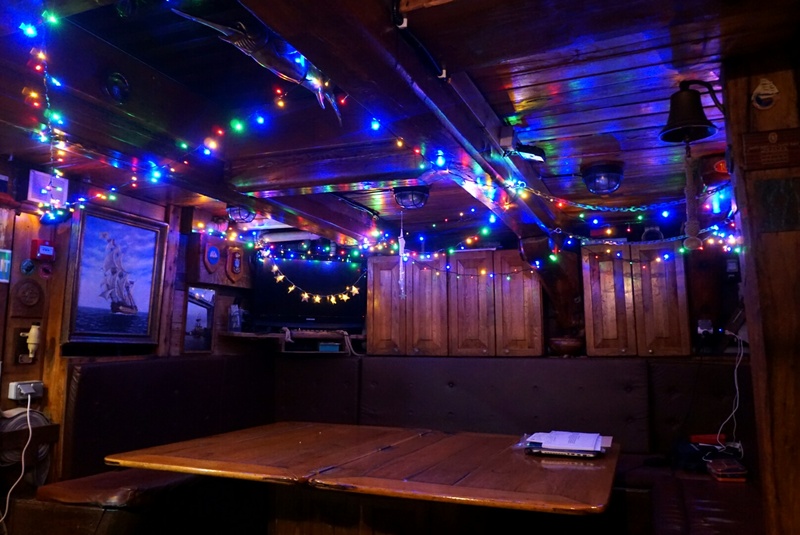 Tomorrow we will try to put fairy lights outside and the ship will be a real beauty! 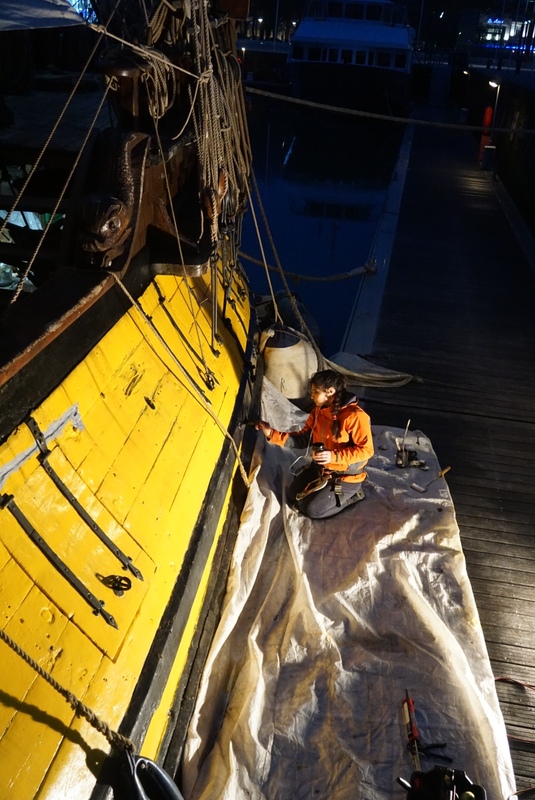 That aside, we paint, we varnish, we caulk, we repair sails, we fiddle with wires))) The busy bees are buzzing! 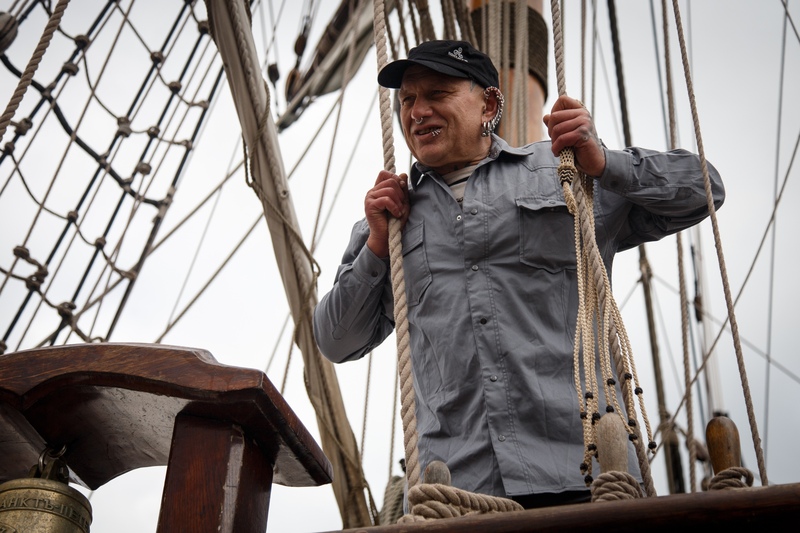 The Sail Training International conference started on November 29 in Seville Vladimir Martus, the Captain of the Shtandart, also took part in the conference. For three days the participants of the conference - captains, managers, and youth crews - have been sharing their experience coordinating the plans for the coming seasons. 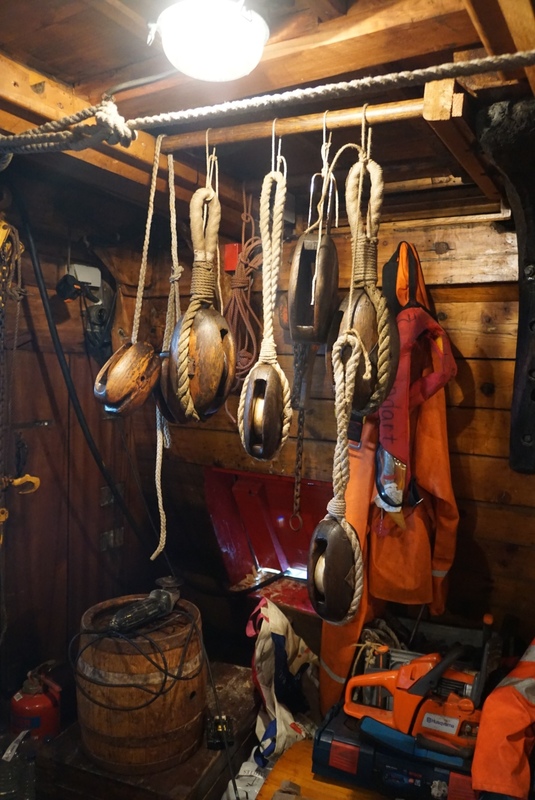 We are waiting for news from the world of sail training ships and maritime festivals. 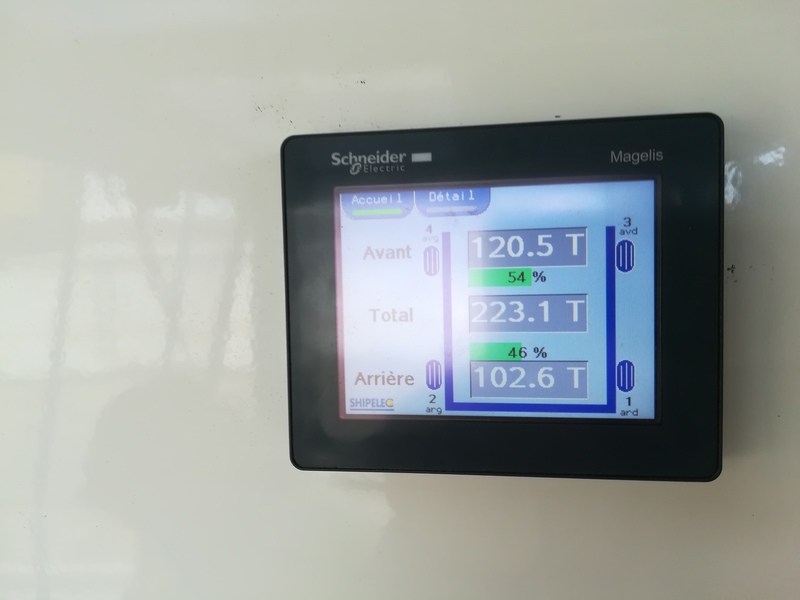 Summer 2019 is expected to be hot! On Friday, December 21, in St. Petersburg, a course of lectures “Fundamentals of Marine Navigation” began. 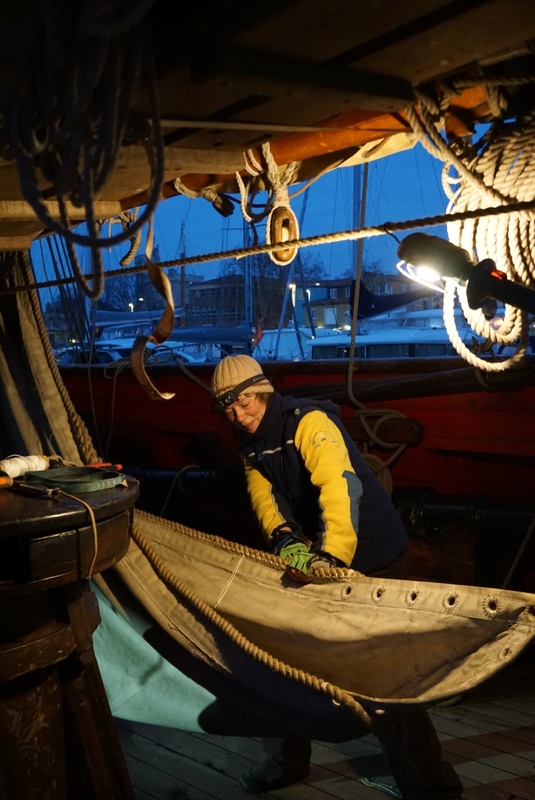 The course will be interesting for those volunteers who are going to sail the Shtandart and captain's gigs, but also it is a good opportunity to communicate with the participants of our project. You are most welcome! That week we had on board the team of the Ed Khalilov’s project “Science of Victory”. With these guys we saw angry and calm sea, stormy nights and rest days in sunny Spanish cities, we had cannon salutes and poems on the high seas. Previous episodes can be watched on the author's channel.